I've been reading Tippi Hedren's autobiographical book The Cats of Shambala (1985) and, before I go on, I have to get this out of my system. First of all, Tippi (or, perhaps, co-author for hire and ghostwriter extraordinaire Theodore Taylor) knows how to tell a good story and keep those 288 pages flipping by. But the best part is that just about every fifth or sixth page contains a revelatory bonne bouche that upends everything we thought we knew about Hitchcock's last official blonde. For instance, says page 31: "I was a good technician, I believed, but I had no pretensions about winning Oscars." BOOM! Really?! Interesting slant, considering that, out of the blue, Ms. Hedren has recently started buttonholing anyone with ears to drop pissy-vinegary sound bites about how the director quashed her chances for earning an Academy AwardTM. The Cats of Shambala focuses on a fascinating—and relatively unknown—period in Ms. Hedren's life: a decade in which she tried to make Roar!, a movie starring 132 lions, tigers, jaguars and other wild cats, herself, her husband and four teenage children, including her daughter, Melanie Griffith (yes, one and the same). And then there's her legendary courage. During her Hitchcock years, she dodged live birds hurled at her and allegedly ducked sexual advances from the (she claims) possessive director himself. But none of that was anywhere near the bravery she would demonstrate—and come to expect from cast and crew—as producer and star of her own movie. In 1969 or 1970, she and then-husband Noel Marshall began development of a movie that they would co-produce about the mayhem that ensues when humans try to live with lions and tigers. Taking note of the risks involved in such an undertaking, they made a series of extraordinary decisions. Realizing that they could not hire professional actors who had no experience working with wild animals, and that movie stars were out of the question, they decided to learn how to handle wild cats themselves. So they cast themselves and their children in the film. And in order to bond appropriately with the animals, they brought some of the creatures to live in their own home. Talk about crazy cat ladies. Thus, on May 2, 1971, Neil, a nine-foot-long, 400-pound lion, took up residence with Hedren, Marshall, 13-year-old Melanie and Noel's three teenage sons, Jerry, John and Joel. "One afternoon I came back from the canyon to view the wreckage of a cat tornado.... I found the Texas trio [of wild cats] pulling our king-size mattress out of the sliding door to the patio. The cover had been ripped off and the foam mattress looked like Swiss cheese, holes in it as large as dinner plates. They had also had a tug of war with the bedroom drapes, which were ripped our of the traverse rods and were hanging at half mast." Shooting was expected to last about six months. But floods, fires, budgetary crises, wild animal rampages and en masse resignation of production crews (for reasons that will soon become obvious) threw the schedule off and development actually stretched out to a full eleven years. Life-threatening animal-related injuries became routine. Read a few of Hedren's descriptions of these disasters—if you think your stomach can handle it. "The next thing I knew, Cherries was running hard at me again, then she was on me, both paws on my shoulders, pinning me to the log. She took most of my head into her mouth, grasping the back of the skull. I could hear her teeth scraping bone and the sound was truly unforgettable. There was a resonance to it that I still find hard to describe. It was like being in an echo chamber as her teeth raked my skull.... The scalp bleeds profusely, I learned, and a gush of red spread over my face." Cinematographer Jan de Bont (Die Hard, Basic Instinct) had his entire scalp removed in a cat attack. 120 stitches were required to replace it. On another occasion, Noel nearly died when a severe cat bite became infected. "One afternoon [teenager] John [Marshall] was walking with Tongaru near the newly-completed African house, by the lake, when he tripped over a rock hidden in high grass and landed face down. Before he could even try to push up, Tongaru was on him, his big mouth closing over the back of John's head. The lion did not try to penetrate the skull; rather, he seemed content to just hold John's head in his mouth.... Though he'd been around lions and tigers for almost two years, John had never experienced being trapped under one. He was visibly shaken from his twenty-five-minute ordeal. He was treated for scalp wounds at the hospital in Saugus, but not much could be done for his mental state." Jerry Marshall's leg was mangled by a lion that Hedren described chucklingly as having a "tennis shoe fetish." Following an unexpected clash between two lions, Melanie Griffith quit production, saying, "Mother, I don't want to come out of this with half a face." She later reconsidered and joined the cast again—only to be clawed in the face. Not only were the humans at risk, but so were the animals themselves. Violent territorial fights had to be broken up. The elephants fought. Oh, did I mentioned that the menagerie included two elephants? In addition to the 132 lions, tigers, leopards, cougars and jaguars, there were three aoudad sheep, as well as ostriches, flamingoes, marabou storks, black swans and, of course, the elephants. One of which broke Hedren's leg. Which subsequently developed black gangrene. Their neighbors' safety was put at risk when the cats would periodically escape from their home and from the compound. I'm just scratching the surface here. There were many more bumps, scrapes and near-death experiences. Hedren was once bitten on the breast by a needle-fanged lion cub while bottle-feeding it. She lost track of how many times Noel was bitten, having stopped counting after 11. She also chalked up their determination to continue production as an "obsession." Finally, though, they were done. "Noel had had a vision and together we had accomplished it, no matter the cost, in both money and human terms." All right. Enough about Roar!. Let's return to Hedren's aforementioned recollections about shooting conditions for The Birds. By the end of that week shooting the attic scene with live birds hurled at her, Hedren was on the edge. As she told biographer Donald Spoto, "One bird that was tied to me jumped from my shoulder onto my face and landed near me eye, scratching my lower eyelid." She collapsed into hysterics. Later, physicians ordered a 10-day leave of absence to recuperate, but Hitchcock allegedly protested, saying, "We can't do without her! We need her on Monday for the last few shots. According to Hedren, the doctor said, "Are you crazy? Are you trying to kill her?" Fans of Hitchcock are familiar with this story, and it is a central talking point in Hedren's narrative about how abusive she claims Hitchcock was. Yet, her personal sacrifices for that film pale in comparison with the ordeal she inflicted on herself and others while making Roar!. And, though she suffered for Hitchcock's vision, she was immortalized by it as well. To this day, in tribute to her unforgettable role, she embellishes her autographs ($20 a pop, thank you very much) with little v-shaped birds. So it seems rather disingenuous that Hedren would wrap her reputation around the trials Hitchcock put her through when, upon being granted similar power as a producer, she went on to put more people in danger, overseeing more trauma and injuries in the making of Roar! than Alfred Hitchcock did in his entire 50-year career. Is Tippi Hedren so lacking in self-reflective capabilities the she has failed to recognize the hypocritical position her own words put her in? According to her, Cary Grant dropped by the set at that time and said, "I think you're the bravest woman I've ever met." Her commentary? "I don't know if that was the right adjective for it." What adjective do we use to describe her choice to cohabit with wild animals, putting her life and that of her daughter, her stepchildren and dozens of other people in jeopardy—all for the sake of a movie? What additional adjectives come to mind about about a person who does all that and then vilifies Hitchcock, who did far less? And what adjectives should we use in reference to Shambala, her wildlife preserve, whose website proclaims: "As a true sanctuary, we do not buy, breed, sell, trade, or subject our animals to commercial use." But that's exactly how it got its start: purchasing animals from other zoos and preserves and augmenting that population via on-site breeding, all for one commercial purpose: to make a movie. How did that commercially-acquired menagerie morph into the 501(c)3 non-profit we now know? "Noel had previously volunteered to take care of [the cats], financially, as long as they lived. We had assembled them for a purpose, and though that purpose had been fulfilled we still had a responsibility for their lives. Noel loved them as much as I did, but committing himself to feed them and maintain Shambala was more than a decent thing to do. Among my plans was one to establish the Roar Foundation, a nonprofit organization to assist in the care of the animals and continue further in-depth study of the great cat in captivity." Let's get this straight. Hedren and Marshall bought and bred a fuckton of wild animals so they could make a movie, which turned out to be an unmitigated personal and financial distaster. After the dust was settled, they realized they couldn't afford all these creatures, so Hedren devised a tax-sheltered business plan that allowed her to seek private donations to care for the mess she'd helped create. The ironies abound. Alfred Hitchcock, the master of terror, was famous for maintaining an atmosphere of serene control on the set; his horror all appeared on the screen. Hedren, on the other hand, ran what might be the most terrorized set in Hollywood history in the making of a light comedy/adventure flick. Yet, with a little script doctoring here and there, Tippi Hedren gets to be the hero of a story in which she originally played the fool. And that makes about as much sense as her assertion that she was a victim of Alfred Hitchcock's obsessiveness. On that note, drop by in a couple of days. Wow, Joel, this whole "Roar" saga gets weirder and weirder to me. Hitchcock might have been something of a unwanted uber-Svengali toward Ms. Hedren, but imagine what the cast and crew of this movie went through. Would you let your only daughter sleep in bed with a lion. This is beyond psycho to me. I remember seeing ads in "Variety" in the mid-70s about this movie. I thought it was some B-movie thing that Hedren was producing to get her career going again. (I hadn't read St. Donald the Spoto then.) I had no idea she was in this deep. 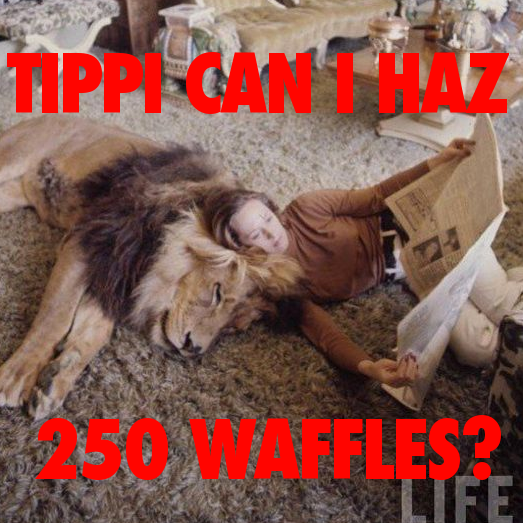 And really, Tippi, look in the mirror next time you call out someone for being cruel to others. Wow, Joel, this whole "Roar" saga gets weirder and weirder to me. Hitchcock might have been something of a unwanted uber-Svengali toward Ms. Hedren, but imagine what the cast and crew of this movie went through? Would you let your only daughter sleep in bed with a lion? Would any sane parent? This is beyond psycho to me. I remember seeing ads in "Variety" in the mid-70s about this movie. I thought it was some B-movie thing that Hedren was producing to get her career going again. (I hadn't read St. Donald the Spoto then.) I had no idea she was in this deep. And really, Tippi, look in the mirror next time you call out someone for being cruel to others! I'm flabbergasted that Tippi Hedren placed her children in such jeopardy. The mind boggles over the daily dangers these kids faced for 10 years. And why didn't children's services interfere? No one will ever know what really happened between Tippi and Hitchcock. I've read a couple of recent interviews, in which Tippi comes across as really bitter. Maybe, over time, she's convinced herself that Hitchcock was the reason she never became a big studio name. But after watching Marnie and The Birds, I'm inclined to think it was simply her acting skills. Talking about books ... do you know if this re-issue of Stephen Rebello's book on the making of Psycho will have any new contents? You've hit it right in the nail with this actress, whose attacks on her long departed artistic maker is more horrendous than her own acting, to be frank. Tons of actresses struggled with adversity, present and past, but talent showed through and they succeeded. It appears that at the end of her life she needs to justify herself somehow. This is why her 'recollections' had become more bitter, and will continue so, because this, unlike her own 'autobiography', is a narrative she can live with in her latter years. Evil and sad. Tippi Hedren was not an actress before She was casted in the birds by Alfred Hitchcock so Her acting Career was non existent. I heard her say that Hitchcock tried to destroy her career. Because she was under contract to him he decided that he wouldn't put her in anymore films or let any other filmmaker use her. But In the actual records it shows that more than a year after her last film with Alfred Hitchcock & with several years still lift on her contract Hitchcock sold her contract to universal. It was they who would later destroy her contract because according to the contract terms she was to be paid $600 a week whether she was working or not(a lot of money per week 50 years ago). After they tried casting her in a few times & she refused to do it they tore up the contract because they didn't want to keep paying someone who didn't want to work. She also said that filmmaker Francois Truffaut was one of the filmmakers who tried to cast her but Hitchcock wouldn't allow it. But Francois Truffaut's family has denied this saying that he was very opened & for years afterward would always talk about his films & talk about every actor he casted & tried to cast. But not once did he ever say that he tried to cast Tippi Hedren nor did he say that he ever wanted to work with her.